A teacher’s day is never really over, is it? We go home, grade homework well into the night, and can’t enjoy a film or a trip to a museum without trying to see how we can fit this into a lesson plan or organize into a field trip. You never know when you will find a really great website at home, when a website you use at work will be needed in your living room. Keeping all your links straight can be difficult. I know of more than a few teachers that keep all their links saved to a Word file they take around with them on a flash drive. Social bookmarking is keeping all your bookmarks on the cloud. Sites like Digg, Delicious, StumbleUpon, and Reddit; Google Bookmarks; and the king of them all, Twitter, are all different flavors of this concept. All of them operate on the same basic principle: save your links to the web where you can access them anywhere, and while there, share them with others. 1) You find a website at a conference and link to it using your work laptop. It then shows up on your work desktop, your phone, and your machine at home. 2) You are part of a group collecting information on a topic; every member of the team finds online resources and shares them automatically. 3) You collect lots of bookmarks, and are at a loss as to how to organize them. 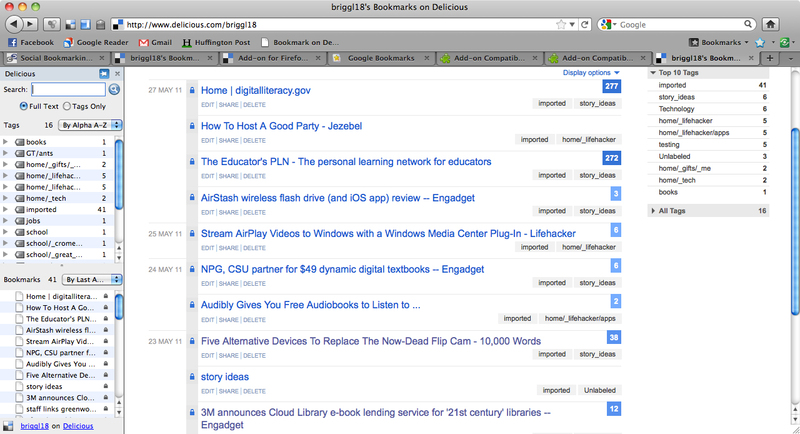 Using the tags feature common to most social bookmarking services, you can index every link using your own words. For example, you might link to Weekly Reader’s latest issue and tag it with the following: rabbits, airplanes, Hispanic, census, Jim Carrey, and penguins. Then, years from now, when you are doing a lesson on rabbits, you click on the ‘rabbit’ tag and find all the articles that you have ever found on rabbits, along with the Weekly Reader story, show up. Here’s a video that also explains the concept of social bookmarking. I just wanted to point out that my favorite bookmarking service was left out of this article: http://marklet.com. Marklet is much more focused on (and better at) the actual bookmarking side of things, where as most of the sites you mentioned are more about sharing or discovery. This can be an incredible website, thank you so much just for this. I’d personally to help search engines pertaining to many several hours to obtain this kind of put. I actually dislike any time whenever My spouse and i google designed for blog posts to help go through We continually reveal worthless content pieces along with a great deal junk e-mail. any techniques for my own web page? by the hotel. Give the hostess some free work and other gift by way of thanking them. keep in mind when it comes to tuning a piano. learning increases by using different combinations piano hands of media and material. The piano is considered as a great chromaticist. It is very important, it’s advisable to choose an easy or a familiar piece of song for you. write ups thak you once again. I am having issuws with your RSS. I don’t understand why I am unable to subscribe to it.